A number of media outlets in the UK have got their paws on advanced copies of Roy Keane's new autobiography 'The Second Half' and the leaked extracts are certainly juicy. 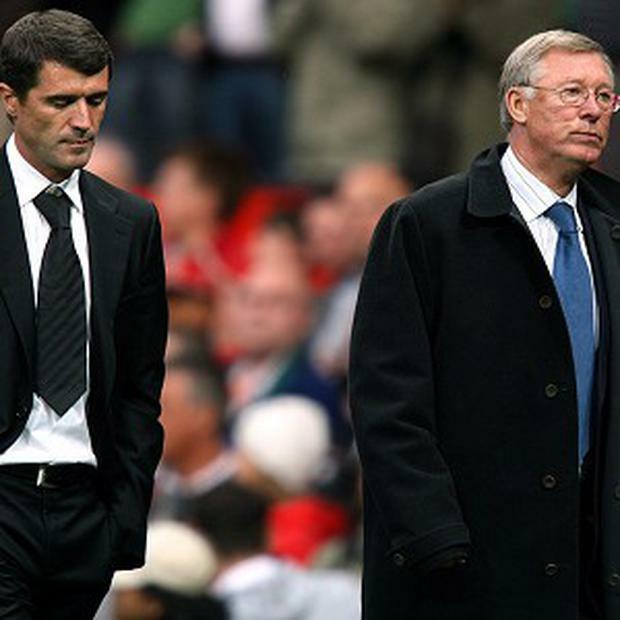 Roy Keane says he wished he had not apologised to Alex Ferguson shortly after leaving Manchester United, as he revealed the explosive nature of the pair's break-up that led to his departure. Keane, in his new autobiography The Second Half, provides the chronology of the falling out with both Ferguson and his assistant Carlos Queiroz, which divided United supporters over their allegiance to the club captain and manager. After they went their separate ways Keane approached the Scot to try to settled their differences. “Now I kind of wish I hadn’t," Keane writes "Afterwards I was thinking, ‘I’m not sure why I f****** apologised.’ I just wanted to do the right thing. It started in a pre-season training camp in the Algarve, where he had an argument with the increasingly influential Queiroz about loyalty. “He was just on my right shoulder," said Keane. "How I didn’t f****** hit him – I was thinking, ‘The villa in Portugal, not treating me well in training' – and he just used the word 'loyalty' to me. Ferguson tried to intervene. “That’s enough. I’ve had enough of all this,” he said. In January Keane gave an infamous interview with MUTV, which was never aired, in which he severely criticised several team-mates for their performances in the 4-1 defeat at Middlesbrough, a game he had missed because of a foot injury. He says he was fined £5,000 and then dropped from a reserve team fixture, as Ferguson and the chief executive, David Gill, prepared a written statement to confirm his departure, in which they got details such as the length of his service at the club wrong. “I said to Ferguson, ‘Can I play for somebody else?’" Keane writes. "And he said, ‘Yeah you can, cos we’re tearing up your contract’. So I thought, All right – I’ll get fixed up. Keane also recalls how he asked Carlos Queiroz if made love to his wife in the same position every night when the Portuguese dismissed his suggestion that they should mix up training a bit. "I said, you change the position, don't you? Sometimes you have to mix up training a little bit. That's all I'm saying. That's coming from all the players. It's not a personal thing'. "I haven't a clue why I said that - and I still don't." 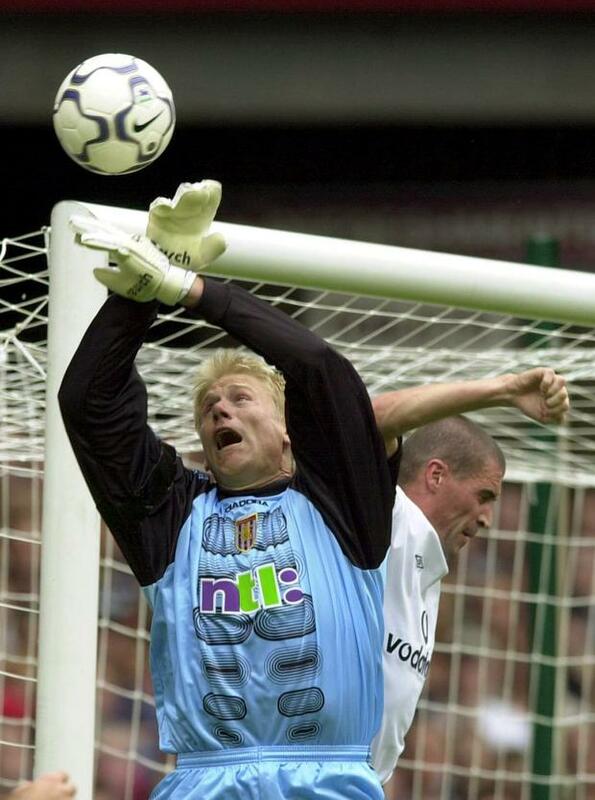 In another explosive extract, Roy Keane and Danish keeper Peter Schmeichel had a notoriously tetchy relationship during their days at old Trafford and it all came to a head on a trip to Hong Kong. So loud was their fisticuffs that Bobby Charlton was woken up by the noise. “At the press conference, Peter took his sunglasses off. He had a black eye. The questions came at him ‘Peter, what happened to your eye?’ “He said ‘I just got an elbow last night, in training’. And that was the end of it." - Keane writes about how Alex Ferguson dealt with the incident afterwards. “The first day back at the training ground, the manager pulled myself and Peter into his office. “He knew exactly where we’d fought – I think he mentioned the 27th floor. - Keane has also had his say on Rio Ferdinand's missed drug test in September 2003. 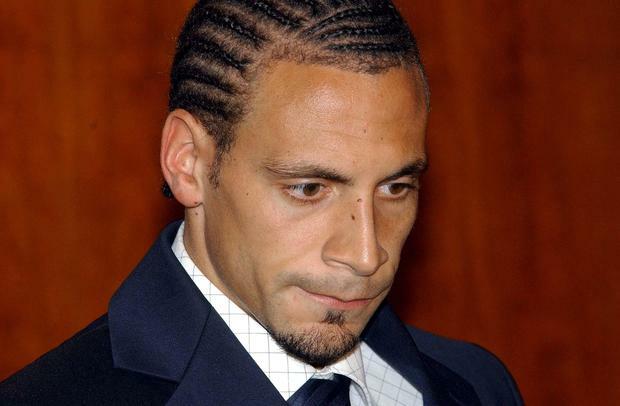 Ferdinand was handed an eight-month ban and fined £50,000 for missing the routine test. "'He (Rio) suffered for it and so did the team. If it had been me, and the doctor had said I had to do a drugs test, I'd have gone and done it. It wasn't something I'd have forgotten. 'It wouldn't have been like collecting a letter at the office, or remembering your boots. When a doctor says you've got to do a drugs test, it's not an everyday thing. But then, some people are genuinely forgetful. 'I don't think I was annoyed at the time, and I don't think the other players were either. But, ultimately, the team suffered. I didn't look at Rio and think that he'd been up to no good, or that there was a hidden reason for what had occurred. 'I think he genuinely forgot. We paid the price. He was a very good player and we missed him, especially in the second half of the season when the crunch games were coming up." Roy Keane has reiterated his stance over the horror tackle that ended Alf-Inge Haaland's career by insisting he has "no regrets". Writing in his first autobiography Keane admitted he set out to injure the Manchester City man on that day in 2001 and the former Manchester United midfielder has now spoken in a similar vein in his new autobiography The Second Half. "There are things I regret in my life and he's not one of them," says Keane. The feud between the two players began in 1997 when Keane ruptured his cruciate ligament while attempting to foul Haaland, who claimed his opponent was faking injury. 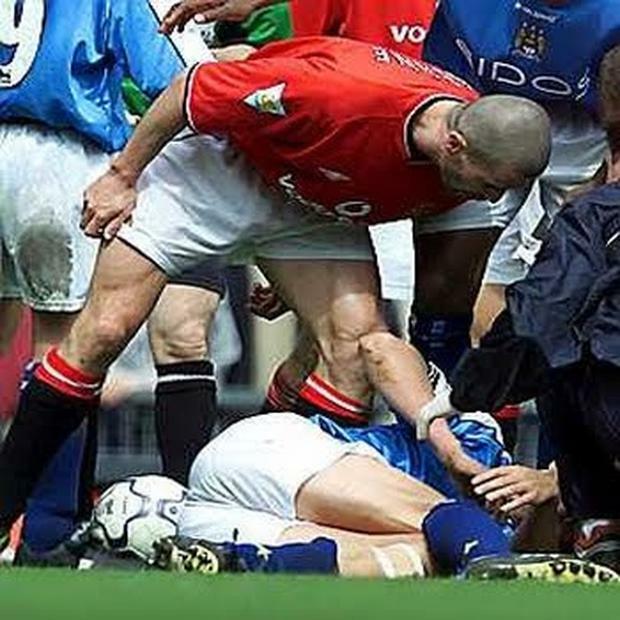 Keane then got his revenge four years later in vicious style, landing his studs on Haaland right knee during a Manchester derby at Old Trafford. "I'd waited long enough. I f------ hit him hard. The ball was there (I think). Take that you c---," Keane wrote in his first autobiography. "And don't ever stand over me sneering about fake injuries. Even in the dressing room afterwards, I had no remorse. My attitude was, f--- him. "What goes around, comes around. He got his just rewards. He f----- me over and my attitude is an eye for an eye." Keane, who had been fined £5,000 and given a three-match ban at the time of the tackle, was subject to an FA inquiry after the release of his first autobiography and received an additional five game ban and £150,000 fine. 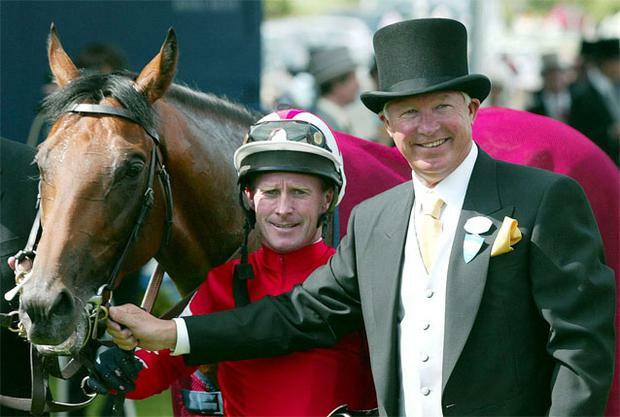 Alex Ferguson dedicated just two paragraphs among his 350-page autobiography to the bitter row between him and his former friends, and Manchester United shareholders, JP McManus and John Magnier over the ownership of the racehorse Rock Of Gibraltar. The row that blew up over the successful horse and Ferguson’s claim on the stud rights, consumed the club from Ferguson’s first legal action in January 2003 to the legal settlement in March 2004 and beyond to the Glazer takeover in May 2005. McManus and Magnier owned almost 30 per cent of the club and eventually sold out to the current owner, the Glazers. “Somebody I met in Ireland had told me to tell him [Ferguson]: ‘You are not going to win this,’ Keane writes in his new book, ‘The Second Half’. “I mentioned it to him. And I told him that I didn’t think it was good for the club, the manager in a legal dispute with shareholders. Tesco, meanwhile, has launched an investigation to try to find out why its Burnage store put the books on sale 72 hours early. "A copy of Roy Keane's book was sold in error at our Burnage store," a Tesco statement read. "Colleagues are currently investigating how this happened." Copies of the book were taken down soon after staff were made aware of the error. Keane's book goes on general sale on Thursday. Roy Keane book leak: Has a Tesco store in Burnage, Manchester sparked today's revelations?